From drab to fab! Updating old broken tiles with a fresh new look. The entrance to this corporate office was in bad need of a make-over. The tiles were cracked, broken and very slippery in wet conditions. We re-tiled the area and applied our anti-slip coating to make the tiles safer to walk on when they are wet. Many older buildings have over the years had a couple of broken, chipped or cracked tiles replaced with similar but not exactly the same tile. This was one such building. This time when the tiles needed attention, the owners decided to re-tile the entire entrance and to ensure safety, they also opted for our anti-slip coating over the new tiles. 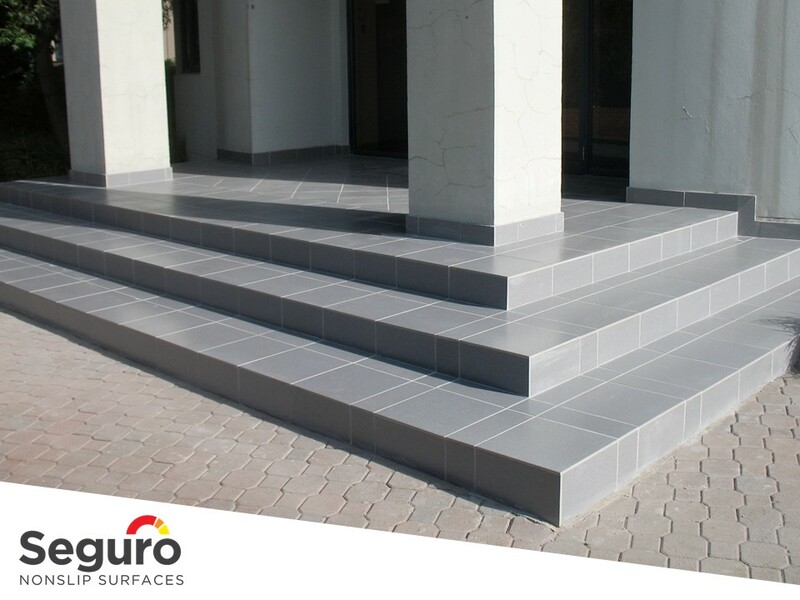 With our anti-slip coating the floor is safer without changing the look and feel of the tiles! This will protect employees and visitors against slips and falls in wet conditions. We also added a weather strip to the entrance and relayed the mat well. View this video to see the transformation.